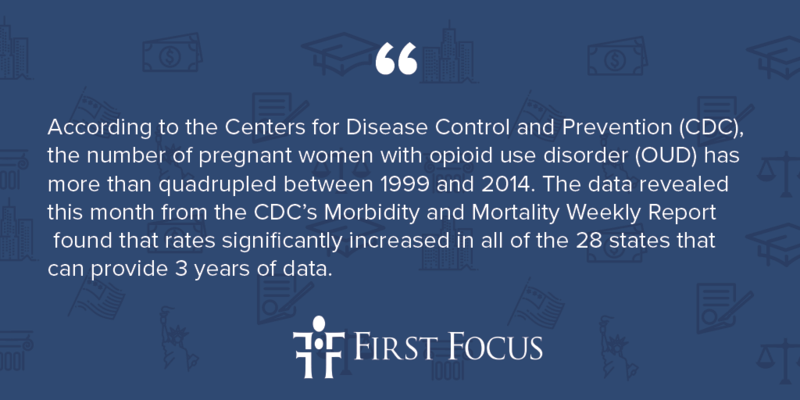 According to the Centers for Disease Control and Prevention (CDC), the number of pregnant women with opioid use disorder (OUD) has more than quadrupled between 1999 and 2014. The data revealed this month from the CDC’s Morbidity and Mortality Weekly Report found that rates significantly increased in all of the 28 states that can provide 3 years of data. It is important to note that the rate of OUD increase varies — for instance, in Maine, New Mexico, Vermont, and West Virginia, the rate exceeded 2.5 per 1,000 deliveries per year. In 2014 specifically, rates ranged from 0.7 in Washington, DC to 48.6 in Vermont. Women should receive access to addiction counseling services as well as medication-assisted therapy, and adequate patient-centered postpartum care that includes mental health and substance use treatment. In 2016, the CDC expanded the Pregnancy Risk Assessment Monitoring System in a number of states to assess substance use before and during pregnancy. First Focus is committed to advocating on behalf of pregnant women and children. The growing rate of pregnant women with OUD is an alarming trend. More states should enhance their prescription drug monitoring programs and improve screening.